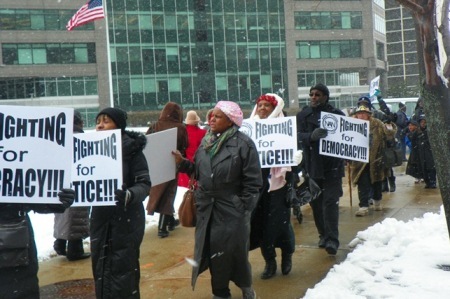 Even Detroit children marched against Jones Day in Cleveland March 25, 2013. 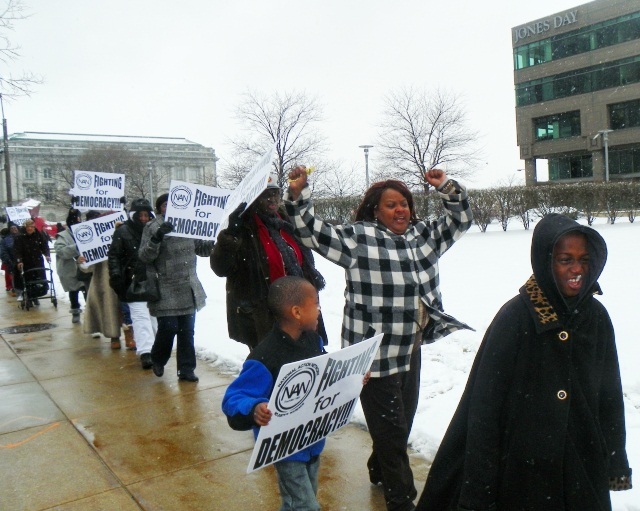 CLEVELAND – A busload of Detroiters protested the emergency manager takeover of their city outside the Cleveland, Ohio offices of Jones Day March 25, the first day of for Jones Day attorney Kevyn Orr’s tenancy as Detroit EM. 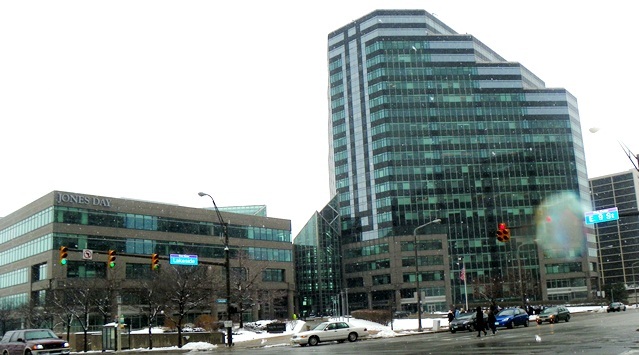 The Jones Day law firm is the “restructuring consultant” for Detroit. 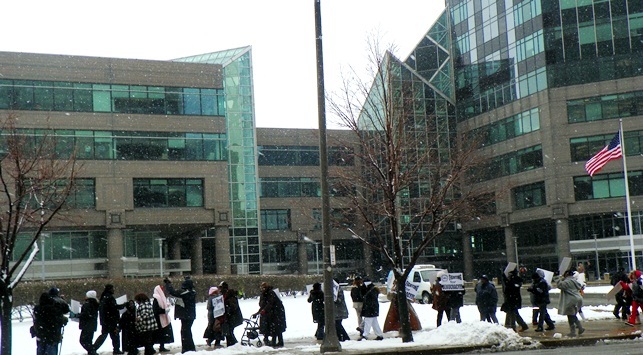 Marchers challenge third largest law firm in the world. Jones Day staff brought coffee and tea to the picket line, which the protesters would not touch, but executives refused to answer questions from the media. 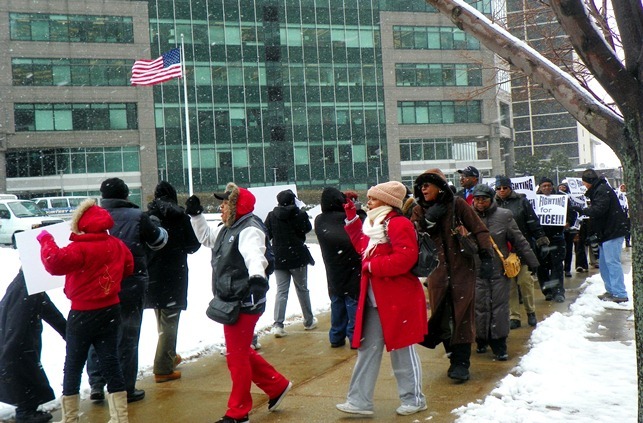 Jones Day execs watch protest; Jones Day is not known for “diversity,” although Detroit EM Kevyn Orr headed their diversity recruitment division. Jones Day is the third largest law firm in the world, with 2,407 attorneys and gross revenues of $1.6 billion in 2012. It was founded in Cleveland and is currently managed by Stephen Brogan out of its Washington office. It has 37 offices across the globe, in the U.S., Australia, Brazil, England, France, Spain, Italy, Russia, both Chinas, Japan, and the Kingdom of Saudi Arabia (where it has three). 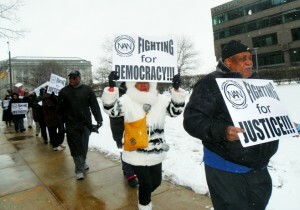 Former Detroit school board member Marie Thornton was among the protesters. 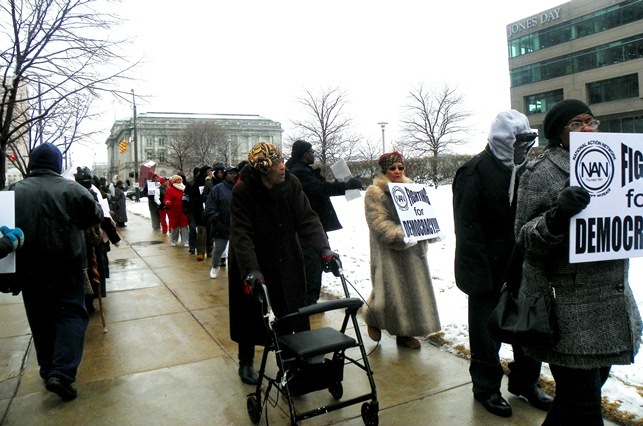 Senior marches with walker, determined to save Detroit from clutches of Jones Day. 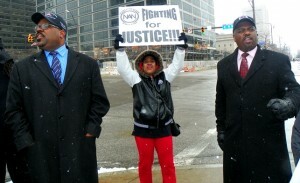 Pastors Charles Williams II of NAN and Cleveland pastor Aaron Ellis, who promised to bring hundreds more to next protest. Wonder why Detroit media including the Detroit News and Free Press strongly favor the installation of Orr and Jones Day and the elimination of Detroiters’ right to self-determination? Jones Day represents some of the biggest media and media-related companies in the country, including the McClatchy Company (formerly Knight-Ridder), which owns the News and Freep. 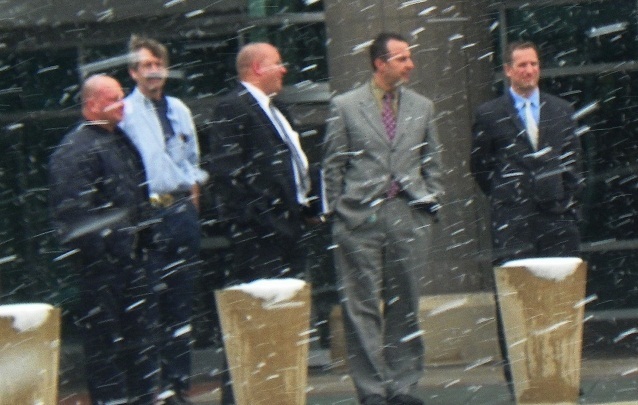 Others include DirecTV, GE, Goldman Sachs, Halliburton, Lehman Brothers Holdings, Liberty Media Group, Time Warner, the Tribune Co. and the Washington Post Co.
Jones Day security officer at left threatened to have this reporter arrested when she tried to go inside to talk to Jones Day spokesperson. The law firm is tied to ultraconservative organizations including the Federalist Society, the Heritage Foundation, the Cato Institute (co-founded by Charles Koch of the infamous Koch Brothers), the Becket Fund for Religious Liberty, and the Center for Competitive Enterprise. It produced U.S. Supreme Court Justice Antonin Scalia, appointed by former U.S. President Ronald Reagan in 1986. Many Jones Day clients oppose provisions of the National Voting Rights Act, patients’ rights to contraceptive care and abortion at federally- funded religious hospitals, regulation of corporate executives under the Sarbanes-Oxley Act, and anti-trust laws. It is notorious for representing the tobacco industry for decades in state and national litigation that continues to the present. It was cold! Marie Thornton, in middle, bundled up in blanket. Most recently, Jones Day partner Michael Carvin spoke at a Heritage Foundation briefing on the “(Un)Constitutionality of Section 5 of the Voting Rights Act,” in Washington, D.C, as the U.S. Supreme Court heard arguments in Shelby County v. Holder. Section 5, which Shelby County, Alabama is trying to overturn, requires that certain States and localities, located primarily in the South and Southwest, obtain federal preclearance for all voting changes before they may be implemented. To obtain preclearance, a jurisdiction must demonstrate that the change neither has a discriminatory purpose nor a discriminatory effect. 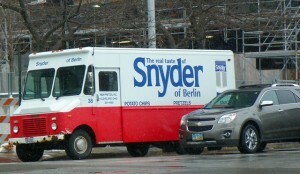 Snyder comes to Clieveland from Berlin, Hitler’s home. White voters are “wide open to electing black Democrats … as much as white Democrats,” Carvin told the audience, according to a Feb. 24 article in the Roll Call newspaper. Jones Day, represented the National Federation of Independent Business which along with dozens of other groups unsuccessfully challenged “ObamaCare” before the U.S. Supreme Court. In league with the U.S. Conference of Catholic Bishops, it zeroed in on the contraception mandate in the health care reform law. 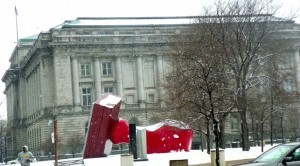 Cleveland even has a monument to Detroit’s City Council, a giant rubber stamp (lol). In 2008, Jones Day represented the Free Enterprise Fund in a challenge to provisions of the Sarbanes-Oxley Act before the U.S. Supreme Court. Sarbanes-Oxley is a federal law that sets stricter standards for U.S. corporations and accounting firms. It requires top management to individually certify the accuracy of financial information and increases the severity of penalties for fraudulent activities. The bill was enacted in response to major corporate and accounting scandals including Enron, Tyco International, and WorldCom among others. In June 2010, the USSC held in a 5-4 vote that restrictions on removal of members of the Public Company Accounting Oversight Board, which supervises Sarbanes-Oxley compliance, were unconstitutional. The act had limited the power of the U.S. President to remove the principal officer of the PCAOB. 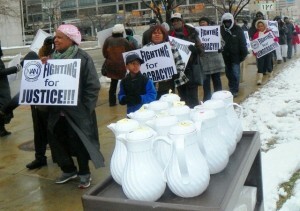 Marchers snubbed Jones Day coffee tray. 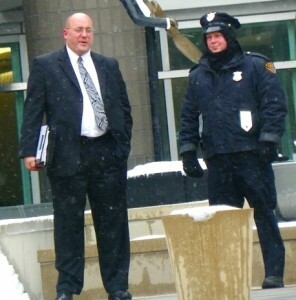 Most notoriously, Jones Day represented R.J. Reynolds and Phillip Morris, two of four defendants, against lawsuits from 46 state attorney generals, which resulted in the 1998 “Tobacco Master Settlement Agreement.” That agreement provided $206 billion over 25 years in compensation to the states for Medicaid-related health care costs resulting from tobacco smoking. Jones, Day, Reavis and Pogue, as it was then known, authored a 460-page document setting forth common arguments against the tobacco companies, and then refuting them. To this day, Jones Day continues to defend tobacco companies against ongoing litigation, arguing meanwhile for changes in the MSA that would benefit the companies. Jones Day Cleveland HQ glowers over the city.